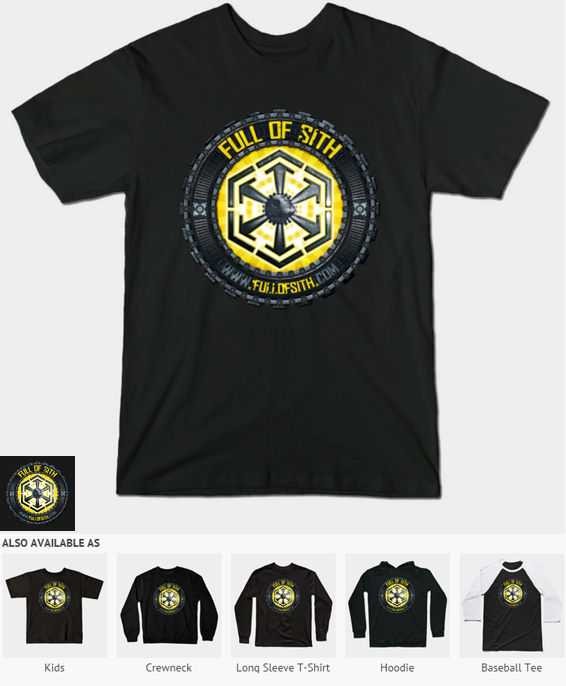 New Full Of Sith T-Shirt! After a very successful run of our original shirts, we have been asked again and again to release a new Full Of Sith t-shirt. Here it is in all of it’s Sithy glory! LOOK FORWARD TO SOMETHING NEW IN THE NEAR FUTURE! Available in White, Heather, Asphalt, Black and Charcoal Heather and sizes from S to 5XL. You can also get kid sizes, long sleeve crewnecks, long sleeve t-shirts, hoodies and baseball t-shirt styles. Ready for you to purchase, receive and wear to “The Force Awakens” opening weekend. MTFBWY Always! Please share this with your friends and fellow listeners and remember this would make a perfect Sithmas present for that Full Of Sith enthusiast in your life. Hey guys! I love the show and listen every week. Any thoughts or plans of making a FOS hat with the t-shirt design on it? I’m a hat guy, and would rock the hell out of it! Hey man, I too am a hat guy! Do me a favor, email me at mike at fullofsith dot com with your request and i’ll look into getting this done.